What were the unique characteristics of the Therizinosauria? The Therizinosauria (or therizinosaurs, also known by the older name, segnosaurs) had so many unique characteristics that they were first grouped with the sauropods. They were then made into a separate group of the saurischians; most recently, scientists placed them together with the maniraptorans, based on various features of their skulls, pelvis, and forelimbs. Therizinosaurs were large, with heavy builds; they had four toes, similar to sauropods, and were quadrupeds. They also had the hollow bones of the theropods, a pubis bone that pointed backwards, and a relatively short tail. One of their major features was the claws on each hand. In several specimens, the enormous claws measure three-feet (one-meter) long. More noticeably, the therizinosaurs were very unique. They had large, leaf-like teeth; the skull shows evidence of cheeks, which means they probably ate plants, though this is still highly debated. If so, they would also be one of the only theropods that didn’t eat meat. In addition, several specimens seem to indicate that some therizinosaurs were covered with primitive feathers. Because not many therizinosaur fossils have been found, little is known about their behaviors. Some scientists suggest that these animals were amphibious fish-eaters; others believe these dinosaurs were herbivores, based on their teeth, possible cheeks, and snout. It is also thought that the therizinosaurs were slow-moving animals. 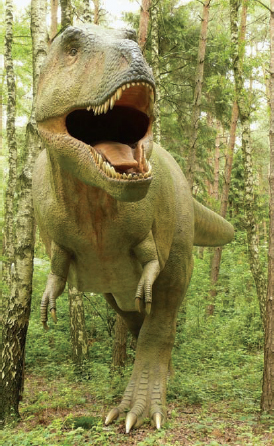 Possibly one of the most well known, if not the most well known, the Tyrannosaurus rex was one of the dominant predators during the Cretaceous period (iStock).